The QIIME 1.9.1 bug fix release is now live, and the virtual machines (Virtual Box and EC2 image) will be available by Friday, 5/29. This release contains several serious bug fixes, detailed in the 1.9.1 ChangeLog, so we recommend that all users update to QIIME 1.9.1. 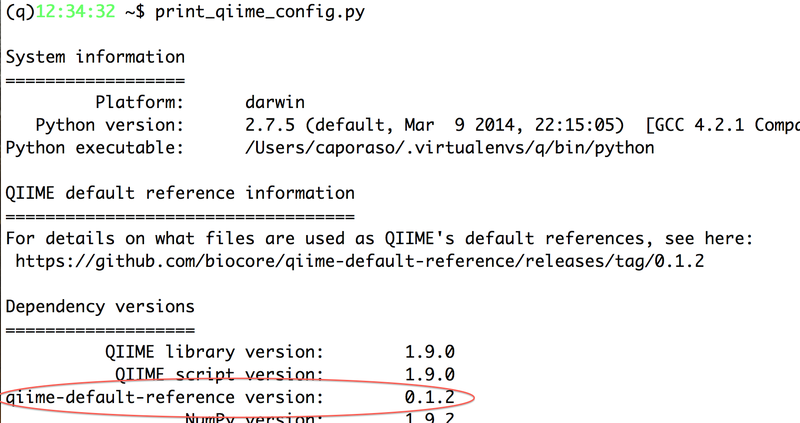 See the instructions for upgrading to the latest version of QIIME. If you have any questions about what’s changed in this version of QIIME, or about the bugs that were fixed, don’t hesitate to get in touch on the QIIME Forum. Finally, several of the QIIME developers will be at ASM next week – come find us to say hello, and we’ll give you one of our new QIIME stickers. This will update the default template alignment used by PyNAST to be the PyNAST-aligned (rather than SSU-aligned) Greengenes 13_8 85% OTU representative sequences. Comparisons of PyNAST aligning against both the Greengenes core set (as used in QIIME 1.8.0 and earlier) and the PyNAST-aligned Greengenes 13_8 85% OTU representative sequences (packaged in qiime-default-reference 0.1.2) are available linked from here. Again, apologies for any inconvenience this may have caused. We discovered an issue in QIIME 1.9.0 with alignment of 16S amplicons that are generated with non-515F/806R primers when using PyNAST with the default template alignment. This bug will only be a problem for your analysis if it meets those exact criteria. This bug stems from an issue with the template alignment that is packaged in the qiime-default-reference project, and would cause many of your sequences to fail to align with PyNAST. The issue is discussed in more detail, including a description of a work-around that we’re currently testing, on qiime-default-reference issue #14. Please follow that issue to track progress on this. We’ll follow-up on the blog and QIIME forum when a fix is ready – we expect that this will be this week. We’d like to thank forum user Slave Trajanoski for pointing this out, and for the helpful example data which let us narrow down the problem quickly. We know that this is very inconvenient, and we apologize for any issues this may have caused. If you have any questions about this, please don’t hesitate to follow up on the forum. If you’d like to know if this issue affected one of your runs, please post to the forum with the output of running print_qiime_config.py. We’re excited to announce the release of QIIME 1.9.0! As is typical for our releases, the QIIME 1.9.0 Virtual Box and EC2 image will be ready in about a week. For details on the new features in QIIME 1.9.0 and how to start using it, see the QIIME 1.9.0 release notes. QIIME 1.9.0 release candidate 1 is now live! We’re excited to announce that the QIIME 1.9.0 release candidate 1 is now live and ready for testing. You can find details here, which includes a discussion of what we mean by “release candidate”. This release candidate is packed with new features, some of which are highlighted in the release notes at the above link. Hope to see you at ISME 15! First, one of the most frequent comments that we get about QIIME (which we completely agree with) is that it is difficult to install. To address this, we’ve defined a QIIME “base install” package, which is installable with pip so greatly reduces the complexity of QIIME installation. The QIIME base install package supports running the most commonly used QIIME commands with default parameters, and in most cases will be sufficient for your entire QIIME analyses. You can find discussion of this in the updated QIIME Installation Guide. Next, our PCoA plots are no longer based on KiNG, but on the new Emperor 3D plotting package. This enables more advanced analysis of PCoA plots in the context of sample metadata, and is one step toward our larger goal of improving QIIME’s interactive visualization capabilities. We’ve added support for assembling Illumina paired end reads in the new join_paired_ends.py script, which wraps ea-utils and SeqPrep, and for working with alternative barcoding schemes used on the Illumina platform with the new extract_barcodes.py. A new tutorial has been added for working with alternative barcoding schemes. We’ve updated QIIME’s default taxonomy assigner to be the new uclust-based consensus taxonomy assigner. This was shown to be more accurate and faster than the existing methods (Bokulich, Rideout et al. (submitted)). Important: the RDP Classifier is no longer the default taxonomy assigner used in QIIME. otu_category_significance.py has been removed in favor of group_significance.py, which supports additional types of tests, and is more maintainable and extensible than otu_category_significance.py. core_diversity_analysis.py has a new parameter, --recover_from_failure, that allows the user to re-run the script on an existing output directory and will only re-run analyses that haven’t already been run. This supports rapid recovery from failed runs, and additionally allows the user to add categories to a previous run, which is very common and previously required a full re-run. We’ve added new script, estimate_observation_richness.py, which implements some of the interpolation and extrapolation richness estimators in Colwell et al. (2012). Important: This script should be considered beta software; it is currently an experimental feature in QIIME. Finally, we’ve updated our documentation on contributing to QIIME. If you’re interested in helping us make QIIME better there are lots of ways that you can get involved. See our new Contributing to QIIME document. And this is all just scratching the surface. There are many more features in QIIME 1.8.0 – for more details you should review the full ChangeLog.